Microbiologists study microbes, which is why they are not called giganticbiologists. Microbes are living things that can only be seen with a microscope. We usually think of microbes as being germs, but only a teeny, tiny percentage of microbes make people sick. Most of them are completely harmless to people and some we could not live without! Microbes may be tiny, but there sure are a lot of them. If you weighed every living thing on earth, much more than half of that weight would be made up of microbes. As scientists learn more and more about microbes, they have realized that microbes inhabit places that we would normally not expect living things to be, like inside rocks in Antarctica, in incredibly hot springs in Yellowstone National Park and on your elbow. There are so many different kinds of microbes that scientists are pretty sure there are way more of them than they have discovered yet. Here are some pictures of a few different microbes found around the world to give you an idea of the variety. One is not a microbe, though. See if you can guess which one. Hopefully you figured out that the one in the middle is not a microbe. 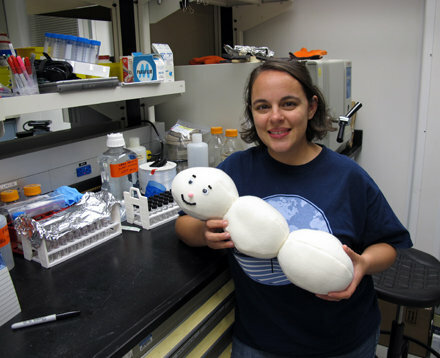 She is Katrina Edwards, a microbiologist and one of the co-chief scientists of our expedition! There are lots of other microbiologists on our expedition, too, and they’re all hoping to learn something about the microbes that live in the rocks beneath the bottom of the Atlantic Ocean!